I had lunch with a friend of mine the other day. Aaron, the father of one of the girls Arianna knows from Monona Grove High School works downtown so we grab lunch every so often. Aaron mentioned that he had recently been to a family reunion in Iowa. It made me think of the Blaser family reunions in Belleville. We’d go hang out at the park in Belleville which was pretty fun. I’d ride my bike around the circle and check out the dam. What I remember most about the park though is the water fights. I remember how cool I thought they were. The volunteer fire departments from the area would bring their teams in and compete. I wasn’t even sure they did that sort of thing anymore, but I looked around and found some pictures online. Water fights are still alive and well as I found several videos on YouTube that remind of those fights. Not from Belleville, but very cool just the same. I hunted around and did see that Kewaskum had water fights this year and their department came in first place. I did a little more poking around and found info on the Wisconsin State Watertight Championships. Hosted in Plainfield, Wisconsin in mid-July. 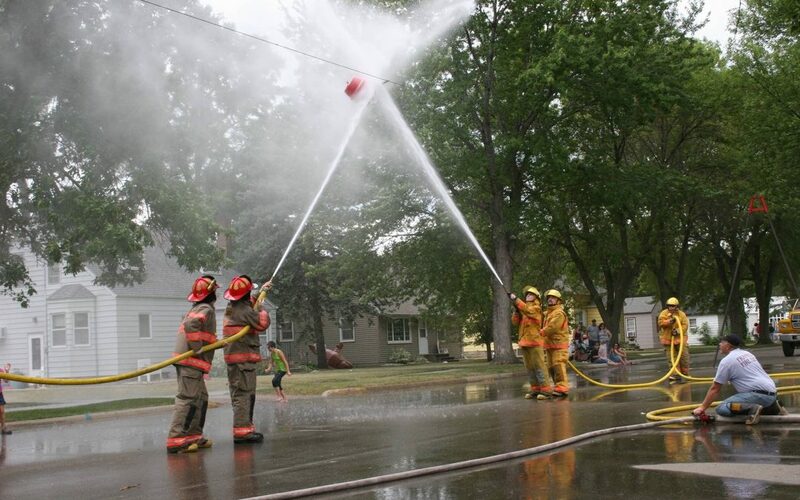 They water fights were part of the Plainfield Fireman’s Jamboree. Plainfield isn’t even actually that far away. Right up Hwy 39 just a few miles north of Coloma. I put a note on my calendar to check for dates next summer as I would love to check it out.